Modern onboarding software has dramatically reshaped how companies, large and small, can approach training programs that are both highly customizable and affordable for their new employees. With this in mind, think about the traditional hiring process. Despite constantly seeking new and imaginative ways to revamp the hiring process, most companies today are still stuck devoting months and countless work hours to filling a single open position. Whether you are optimizing the application process through online portals, sifting through piles of resumes, scouring LinkedIn with a recruiter, or conducting phone screenings, the hiring process is a draining endeavor. Trying to find that rare moment of the week where the members of a department have their schedules coalesce perfectly to set aside an hour-long interview is a huge challenge. Unfortunately, this process can take so much time that once a new employee is hired, the department is stuck playing catch-up and the new hire is thrust right into the action. This is a frequent and crucial mistake for businesses to make, yet they continue to do it over and over. Without putting your new employees through a proper onboarding process and training period, you leave a lot to risk when it comes to their integration into your organization. An increased focus on better training leads to more well-rounded employees who you can retain at a higher rate. Often in business, you’re taught that ‘increased focus’ is just another way of saying ‘more money’. That’s not the case here. Take a look at the reasons why employees shouldn’t simply be thrown to the wolves, then pivot to our top suggestions when looking at how to overhaul your training processes. Throwing new employees into the new job may seem like the best way for them to learn and adapt to the office environment. However, in any position with a degree of uniformity in communication and procedure (most modern office jobs), you need to conduct proper onboarding. Think back to algebra class in grade school: your teacher always asks for the answer, but more importantly you were asked to show your work because the teacher is more interested in ensuring that you’re following procedures that will assist you in solving any problem you may face, not just that one single problem. Think of onboarding employees in the same way. Yes, your new employee may figure things out for themselves, and yes, they may get the right answers in the beginning. If they’re not following the same procedures that the rest of your company is following, communication and project collaboration is frustrating for team members. If you’re not teaching them procedures, it’s likely that there is no formal procedure, which makes solving institutional problems a nightmare. You can trace this back to improper onboarding. You need employees to feel a degree of comfort in their work. If they feel like they’re understanding the schemes of the organization, they’re far more likely to stick around for the long haul. So onboarding is very important. What should you look for in an onboarding and training software program? First of all, you want whatever program you choose to be simple to set up and manage, and you want your employees to feel comfortable using it. The goal is for the employees to spend their time learning how to perform their tasks, not devoting that time to cycling through the software FAQ to figure out how to troubleshoot issue after issue. One of the ways that onboarding software is cost effective is that it doesn’t require IT experience to manage; a quality software is user-friendly enough for your HR department to tackle. This makes HR lives much easier. 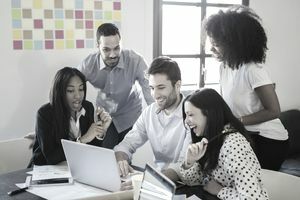 Keep your eyes out for software that can easily implement existing company training materials so you can get started and explore ways to optimize the program while getting employees used to the interface. The best software allows you to upload materials of multiple file types and convert them into a proper online training course. As a younger generation moves into the workplace, a greater population of your employees will practically live on their phones. Instead of forcing them into training programs that are desktop-centric, use this fact as an opportunity and make mobile a must-have for your onboarding. Find software that will seamlessly convert materials for use on mobile devices. This allows your employees to train how they learn best and to take their training with them anywhere, at their desk or on their couch. Let’s face it: training is useless if you have no way to measure its impact. A software program that makes ample use of analytics and data reports on employee progress is crucial. The strongest programs will make use of customized tests created by the software to best examine retention rates in your employees based on what they’re learning. It is also necessary to use corresponding performance indicators to measure improvement. Making this data available on the employee end is vital as well so that your team can monitor their own progress and self-reflect. The proliferation of video in everyday life, from marketing to education, makes purchasing an onboarding software with video capabilities essential. The fact of the matter is that text only goes so far in the training process. After a while of sifting through onboarding packets, employees lose interest and begin to zone out. Search for a package that allows you to create new training videos and edit them within the content management system, or that are compatible with external video content management systems. You should easily archive your videos, including tags that are searchable. Videos that are searchable by audio is a major plus in onboarding software: searching a keyword will bring up instances within videos where the keyword is referenced. It’s easy to overlook the onboarding process or write it off as something too costly for an organization of your size. Onboarding software and management systems are changing the game, and for something so vital as employee training, why not take a deeper look and maximize your worker efficiency?